Bed bugs bite you and feed on your blood. You may have no reaction to the bites, or you may have small marks or itching. Severe allergic reactions are rare. Bed bugs don't transmit or spread diseases. Adult bed bugs are brown, 1/4 to 3/8 inch long, and have a flat, oval-shaped body. Young bed bugs (called nymphs) are smaller and lighter in color. Bed bugs hide in a variety of places around the bed. They might also hide in the seams of chairs and couches, between cushions, and in the folds of curtains. They come out to feed about every five to ten days. But they can survive over a year without feeding. Unpack directly into your washing machine after a trip and check your luggage carefully. When staying in hotels, put your suitcases on luggage racks instead of the floor. 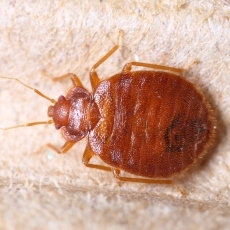 Check the mattress and headboard for signs of bed bugs.